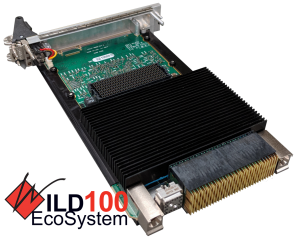 First High-Bandwidth 3U OpenVPX FPGA Board Augments Growing 100Gb COTS EcoSystem - Annapolis Micro Systems, Inc.
Annapolis Micro Systems, a leading FPGA board and systems supplier, is now shipping its first 3U OpenVPX COTS FPGA board with 100GbE capability. The WILDSTAR 3XBM 3U OpenVPX FPGA Processor’s superior bandwidth and speed is designed to address the most challenging real-time data digitization, processing, and storage applications. The 3U board’s debut follows the November introduction of the first 100Gb-capable 6U Board, the WILDSTAR 6XB2. Both boards align with the SOSA™ technical standard. The 3XBM integrates one Xilinx Kintex® UltraScale™ (XCKU115) or Virtex® UltraScale+™ (XCVU5P/XCVU7P) FPGA and a Xilinx Zynq® UltraScale+ MPSoC (XCZU7EV) motherboard controller. The high-performance board also has a WILD FMC+ (WFMC+™) next generation I/O site, for dense, high-bandwidth ADCs and/or DACs. 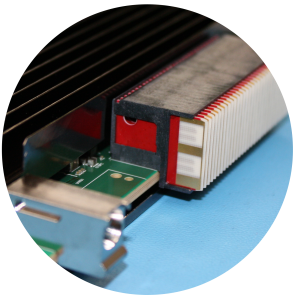 High-bandwidth backplane connectivity is enabled by MULTIGIG RT3 interconnects. The new high-density RT3 is 2.5X faster than existing technology, and enables PCIe Gen-4, 100 Gbps Ethernet, and InfiniBand high-speed bandwidths. The RT3 maintains backwards compatibility with the earlier MULTIGIG RT2. The rugged 3XBM supports industrial temperature ranges, using air, conduction, or air-flow-through cooling. Min/max operating temperatures are -55˚C/85˚C; min/max storage temperatures are -65˚C/105˚C. 3XBM optionally offers VITA 66/67 support, including an x4 FireFly™ optical transceiver. The transceiver allows for optical connectivity through front panel or VITA 66. Annapolis’ powerful BSP options include 40/100GbE IP and both VxWorks 7 and Linux support. This entry was posted in Featured News, Press Releases and tagged 3XBM, MULTIGIG RT3, UltraScale, FireFly, VITA 66, VITA 67, SOSA. Bookmark the permalink.